in the art of compounding a nutritive fluid for infants. but it is also an art that is learned day by day. and not a question of good luck. we lose a chance to claim an aspect of our power as women. and I think of it as feminism in its purest form. To do – write this up in more detail for the effectivecare.info website, initially intended for the gender discrimination section 11 of the policy part but additional information on the health benefits of pumpkin seeds /the food information was added to the home page, I still need to do the additional breastfeeding section though/ – to explain the (todo.footnotes). The reference list below includes notes to expand on at a later time. In the meantime – pumpkin seed kernels are the inner green part that have been shelled. Their texture is similar to sunflower seed kernels but their oil content has a more health promoting nutrient balance than the oil content of sunflower seed kernels. 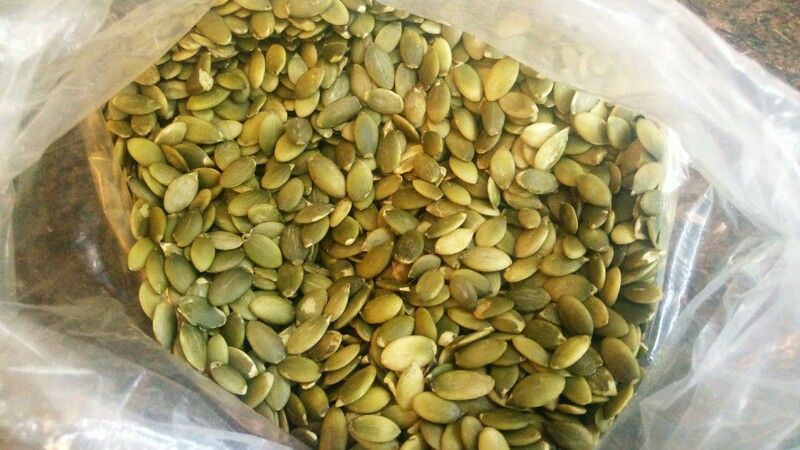 Ideally shop for raw pumpkin seed kernels that are not salted. Salted, roasted pumpkin seeds may also be labeled Pepitos and the salt content may be excessive if eaten in much quantity. An 1/8th to 1/4 cup of raw pumpkin seed kernels, 2 to 4 Tablespoons might be a reasonable serving size of the unsalted type or lightly salted and roasted types. Roasting the seeds increases the phospholipid content but also increases some more negative oxidation chemicals which would decrease some of the benefits of the oil. (P.12) For freshness of the roasted snack, the raw pumpkin seed kernels can be lightly pan roasted for a few minutes with a dash of oil until they puff a little. Toss with a sprinkle of salt and let cool on a paper towel to absorb extra oil. Store any extra in an airtight container to retain crispiness and prevent further oxidation. 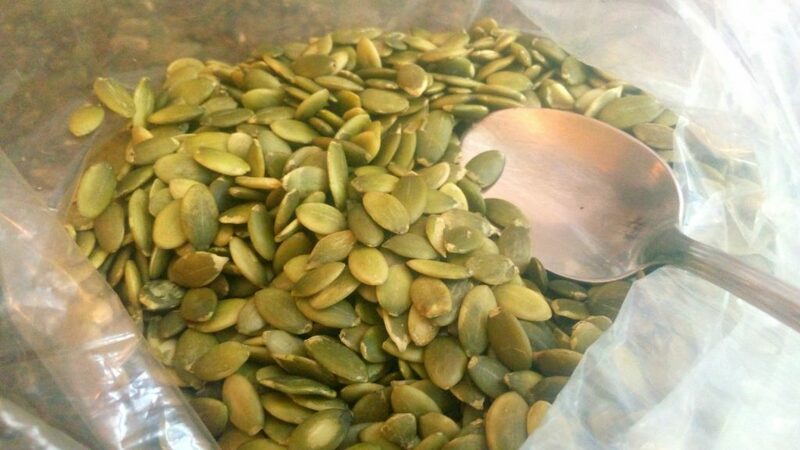 I discuss pumpkin seed kernels as a prenatal healthy food that might help prevent high blood pressure problems on the home page of the website effectivecare.info. It is still a work in progress, un-peer reviewed and draft version in some sections but potentially life saving information is something that I feel deserves to be shared, even if in draft version. The more life threatening type prenatal complication that can include high blood pressure called pre-eclampsia is also discussed in more detail on that website, Preeclampsia and TRP Channels, based on information that has helped former prenatal clients I’ve helped and with more recent information and ,medical hypothesis research posted online by others. What does feminism have to do with breastfeeding? Breastfeeding Medicine, 6/12/2010 https://bfmed.wordpress.com/2010/06/12/what-does-feminism-have-to-do-with-breastfeeding/ (todo.2), Discusses the value of breastfeeding and the issue of class and choice. Women have to be able to afford to have the time off work to be able to breastfeed for the recommended six months, best for baby. If work place policies were more supportive of all women being able to breastfeed, or pump at work, then there wouldn’t be a class issue rich can afford and poor can’t, or seemingly antifeminist, Stay at Home Mom versus Working Mom. Kara Stiles, The Unsettling Truth about Women and Retirement, forbes.com, Dec. 7, 2017, https://www.forbes.com/sites/karastiles/2017/12/07/the-unsettling-truth-about-women-and-retirement/#2b0070991b63 (todo.3) discusses the grim reality of caregivers being primarily women and that the choice or need to be a stay at home mom also means less accrual of Social Security weeks of work over the career lifetime and less accrual of retirement plan savings. Also mentions the difference in life expectancy between men and women and that women living longer are also having more medical expenses to pay on average, over the longer average lifespan. Brooke Hauser, I Shared a ‘Real’ Parenting Photo on Social Media—And the Response I Got Shocked Me, health.com, July 5, 2017, http://www.health.com/family/real-parenting-photo-gloria-steinem (todo.4) Real life story of a working mom who breastfeeds and has two children preschool age or younger. also touches on the increased number of roles women have in our social media and progressive, protest era with a cameo of Gloria Steinem and hat-tip to her role in opening the door to working women who are also mothers. Medela, How to Manually Express Breastmilk, the Marmet Technique, https://www.medelabreastfeedingus.com/tips-and-solutions/130/how-to-manually-express-breastmilk—the-marmet-technique (todo.6) How to tips, and safety, avoid these motions guidance, with illustrations. Medela is a long established lactation supply company with high quality electric and hand breast pumps and educational materials for women. Agnieszka Białek, Agnieszka Stawarska, Joanna Bodecka, Małgorzata Białek, Andrzej Tokarz, Pomegranate seed oil influences the fatty acids profile and reduces the activity of desaturases in livers of Sprague-Dawley rats.